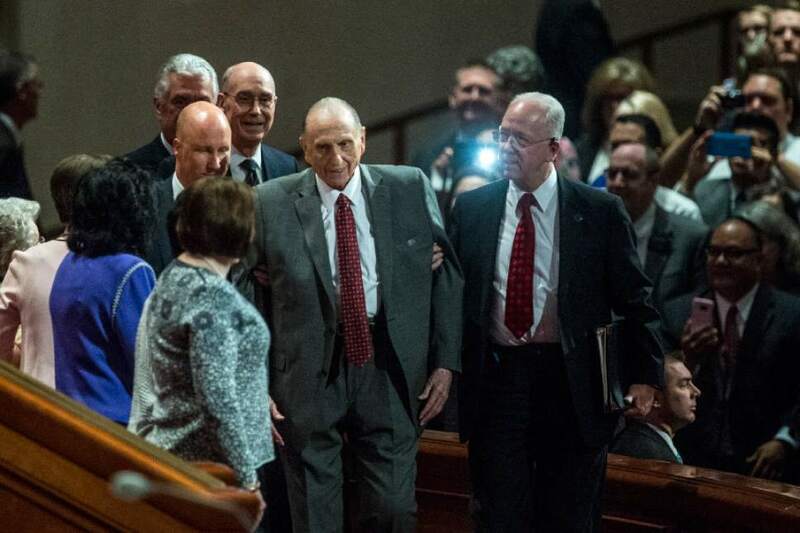 LDS Church's update on leader's health says he consults counselors "as needed." Chris Detrick | The Salt Lake Tribune President Thomas S. Monson arrives during the morning session of the 187th LDS General Conference at the Conference Center in Salt Lake City Saturday April 1, 2017. Chris Detrick | The Salt Lake Tribune President Thomas S. Monson leaves after the morning session of the 187th Annual General Conference at the Conference Center in Salt Lake City on Saturday. Trent Nelson | The Salt lake Tribune Thomas S. Monson speaks during General Conference on April 2, 2017. Chris Detrick | The Salt Lake Tribune President Thomas S. Monson leaves after the morning session of the 187th Annual General Conference at the Conference Center in Salt Lake City Saturday, April 1, 2017. Chris Detrick | The Salt Lake Tribune President Thomas S. Monson's empty seat during the afternoon session of the 187th Annual General Conference at the Conference Center in Salt Lake City Saturday, April 1, 2017. Rick Egan | The Salt Lake Tribune President Thomas S. Monson smiles as he walks to the podium to speak during the 187th Annual General Conference at the Conference Center in Salt Lake City, Saturday, April 1, 2017. Due to declining health, LDS Church President Thomas S. Monson has given up overseeing the global faith&apos;s daily operations, but his absence will scarcely alarm most Mormons. They&apos;ve faced this challenge repeatedly with the rise in LDS leaders&apos; longevity. The 89-year-old Monson no longer goes to his office or attends meetings regularly "because of limitations incident to his age," the Utah-based church said in a news release Tuesday, but rather "communicates and confers with his counselors on matters as needed." 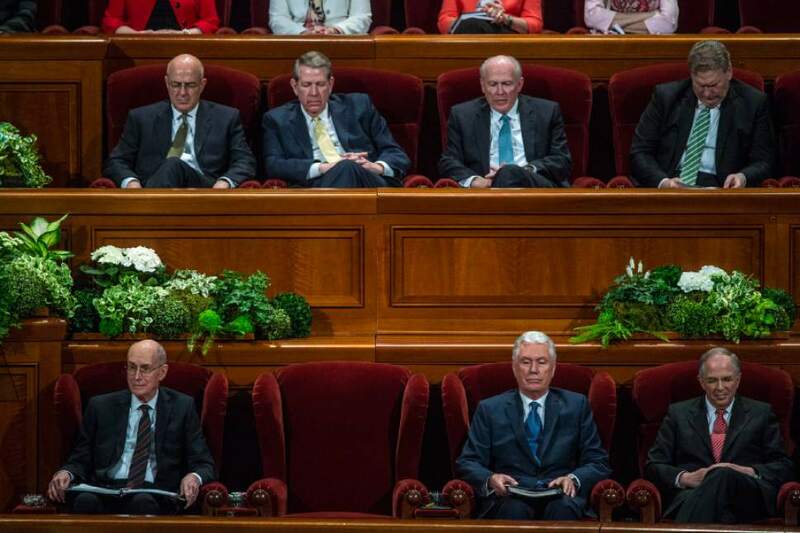 Monson is "grateful that the work of the [governing] First Presidency and Quorum of the Twelve Apostles continues without interruption," Tuesday&apos;s release stated. "He appreciates the prayers and support of church members." 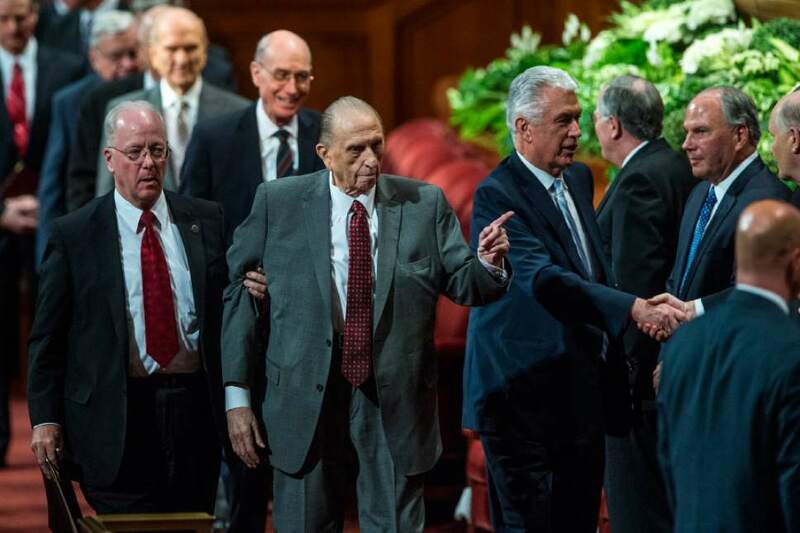 It is the latest update on the health of the 16th president of The Church of Jesus Christ of Latter-day Saints, revered as a "prophet, seer and revelator" by the faithful in the nearly 16 million-member worldwide religion. In April 2015, the affable LDS authority skipped a Salt Lake City meeting with then-President Barack Obama, saying he was preserving his energy for the church&apos;s twice-yearly General Conference due to begin the next day. 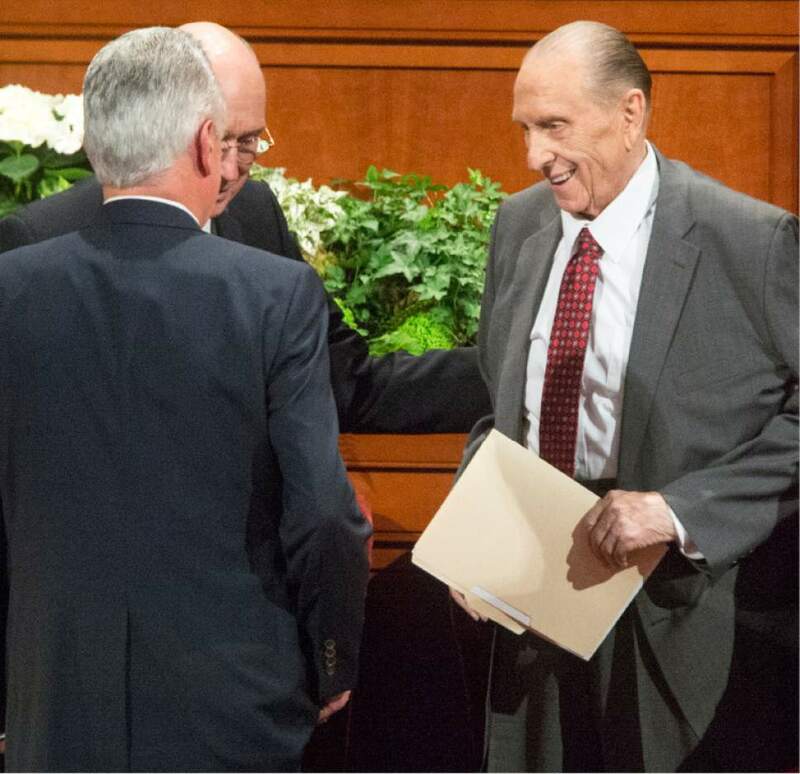 In September 2016, a smiling, but frail Monson joined hundreds of dignitaries as the University of Utah named a recently renovated historic building at the former LDS Business College in his honor. 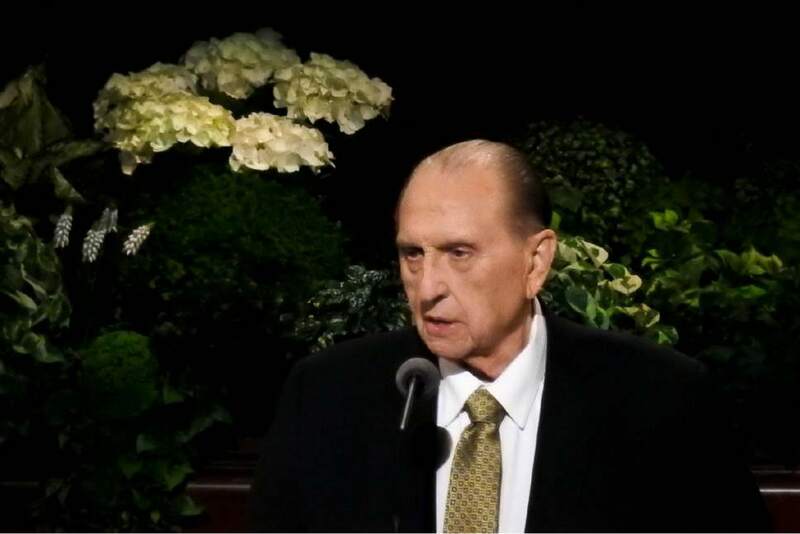 A U. alum, Monson did not speak at the Salt Lake City event, but, as he exited, he waved to the crowd and, in an ode to the U. fight song, said to all within earshot: "I am a Utah man, sir." Monson continued to reduce his participation in General Conferences, trimming his talks to mere minutes. Previously, he offered major addresses at Saturday&apos;s priesthood and Sunday morning sessions, along with opening remarks Saturday and closing comments Sunday afternoon. During the faith&apos;s recently completed 187th Annual General Conference, he delivered two short sermons (announcing plans to build a handful of Mormon temples, including one in Saratoga Springs), but did not attend either the Saturday or Sunday afternoon conference sessions  nor the women&apos;s meeting the prior week. 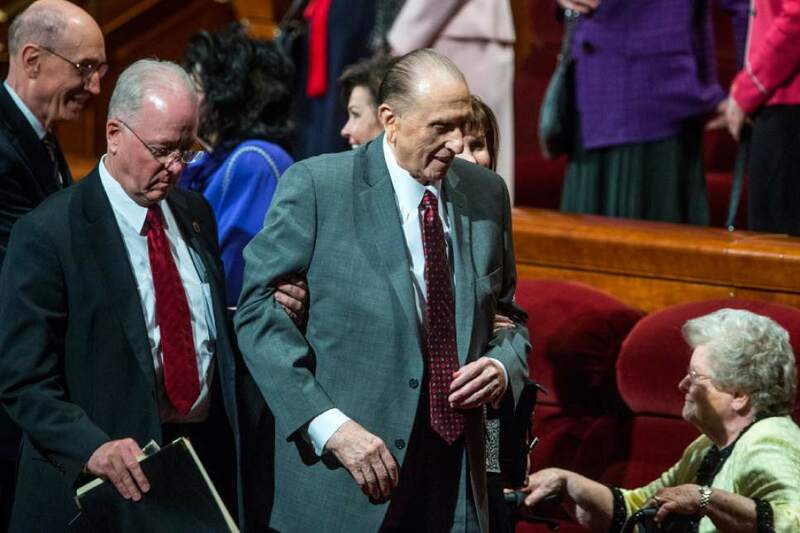 At the time, a spokesman said that Monson was "weary but well." A day later, the aging LDS leader ended up being admitted to a hospital for a couple of nights after complaining of fatigue and exhaustion. On his release, the church stated that he planned to "resume his normal schedule and duties." Monson has been a Mormon general authority for most of his life  more than five decades. He was ordained an apostle in 1963 at age 36 and has led the faith for more than nine years. In spring 2015, the LDS Church announced that he was "feeling the effects of advancing age"  a statement it essentially repeated in October 2016. Don&apos;t expect him or any other Mormon apostles to step aside voluntarily for health reasons. LDS presidents and apostles serve for life, church officials have reiterated. "Emeritus status [granted to lower-level general authorities] is not a consideration for the First Presidency and Quorum of the Twelve." "This is not a situation without precedent," the late Gordon B. Hinckley, then a counselor in the governing First Presidency, said in 1994. "Other presidents of the church have also been ill or unable to function fully in the closing months or years of their lives." Hinckley became church president in 1995 and never faced any mental or physical decline. He died in 2008, and Monson took over. When an LDS president "is ill or not able to function fully in all of the duties of his office," Hinckley said, "his two counselors together comprise a Quorum of the First Presidency. They carry on with the day-to-day work of the presidency. ... But any major questions of policy, procedures, programs or doctrine are considered deliberately and prayerfully by the First Presidency and the Twelve together." In the modern era, a Mormon prophet who doesn&apos;t go into decline "is the exception, not the rule," historian Matthew Bowman said Tuesday. "The church has evolved a structural support system where the president of the Quorum of the Twelve or a member of the First Presidency will step up and shoulder the burden." It&apos;s not a formalized system, said Bowman, author of "The Mormon People: The Making of an American Faith," but is "expected to happen and happens fairly fluidly." In the mid-20th century, medical advancements led to leaders living longer. At the same time, the church&apos;s "correlation" movement increasingly emphasized the importance of the prophetic office and counseled obedience to the man who held it. What to do, then, when that man became partially or fully incapacitated? That&apos;s why this ad hoc system developed, said Bowman, who teaches history at Henderson State University in Arkansas. Others take up the burden of running the church, he said, "but they do it informally to maintain the charismatic authority of the church president."